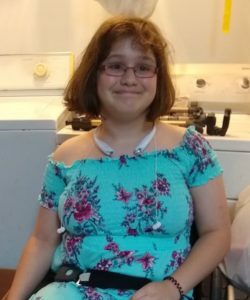 Brianah was born with spina bifida and Arnold Chiari malformation type 2 she later developed hydrocephalus and had to have a shunt put in. She has had over 28 surgeries in her 15 years and most of the surgeries were for her shunt. Because of these shunt surgeries she has some brain damage. Brianah walked with a f o’s and forearm crutches until she was 12 and she’s been in a wheelchair for the last 3 years full time. I found out that Brianah had spina bifida 11 days before she was born and God performed a miracle with her. We were told that her spina bifida was really high and her hydrocephalus was severe. We had church that night because we were in Revival and we had altar prayer for her. When she was born her spina bifida was low and there was no sign of the hydrocephalus! She did developed the hydrocephalus at 3 weeks old but God has been so good to us. She is the friendliest person you’ll ever meet. She does not meet a stranger! She says they’re not strangers their friends. Brianah LOVES to swim, play with animals, and watch YouTube. She loves to sing in the choir at church and go to church and she loves talking on the phone to her friends. Any girl Lego sets. She loves Legos! She loves animals! She wants to be a veterinarian. Mainstays turquoise reversible mermaid sequin throw from Walmart.com… This is not the mermaid tail. It is a blanket. We really need a wheelchair accessible vehicle. I know this isn’t something y’all can get but it is a need since I am getting older and her wheelchairs aren’t getting any lighter. My back doesn’t like for me to pick her chairs up to load them LOL. She is also in need of a power chair or scooter for getting around school. We are working with her wheelchair company but they said, “Don’t hold your breath”.